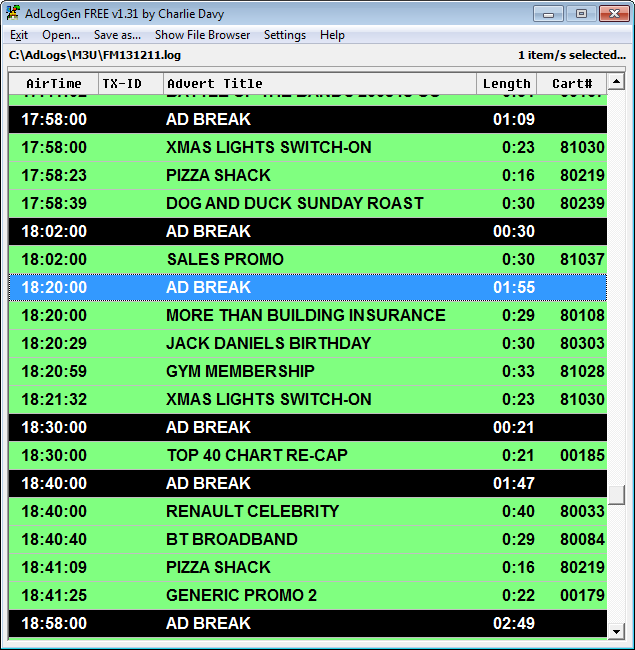 AdLogGen is NOT a scheduling program, but simply a playlist editor! It’s been designed as a go-between app for traffic scheduling and those who wish to manage AdLogs away from their (often expensive) traffic management software. It can be used to create (from scratch) simple advert logs for import into various playout systems (such as Myriad) – You can import a simple M3U playlist (perhaps from StationPlaylist Creator) and then export it to a more advanced format, such as Myriad’s AdLog, RCS, etc. Once you’ve got an AdLog created, you can save it with all of the details an easily open it again later for editing. Will interface with my playout software (or JMD files) to retrieve Cart Numbers allowing you to turn a “domestic” folder+filename M3U file into a professional AdLog using Cart/Cut Numbers.